I have slowly learned to be a bit more free with my pencils and mentioned to me was the use of an easel which made me think of this pad I haven't used in forever ago. IT is an 18x24 drawing pad that I only had two sheets used up on. I thought about the space I had to use. I just let my hand show what my mind and heart were feeling...and this is what came out. I know for most of you this season is bright. But not everyone always is. Usually I am super cheery but last night my heart was sad and the only outlet I felt I had for it was this 18x24 drawing pad. I recently left someone very dear to me and my heart is torn up and trying so hard to heal. I truly feel there are times the way to heal is to draw and release. This was mine. Made Brave Girl Mouse Pads for me and a few friends. Then I took the Template I receieved for free from one of my blogs and made a cute little list pad! Dude and I wish you Merry Christmas and Happy Holidays! The color of rooms has come to intrigue my thoughts today. The Green Room- When I was very young my grandparents house, the farmhouse, had a green room. It was the weirdest room to me since the rest of the house was white. Growing up in was my grandparents room. There was a small, full size bed int eh middle of the room, a vanity dresser along the wall and two small nightstands up against the windows along the west wall. The closet was small but it seemed to be enough for them. I found this room to be a room of nostalgia. My grandmother's jewelry box was on the vanity and I vaguely remember old broaches from her past she wore with scarves on dance floors and such. I always felt nostalgic when I went in there. The Brown Room-My father's room was the only other room in the house with color with the exception of the upstairs and that had wood paneling. My father's room was large. Father's room was subtle and it seemed like a place you always walked into quietly, spoke quietly and in most cases did not go in there because you did not want to bother him. His closet was under the staircase and it seemed even smaller than my grandparents. MY father had a large bed along one wall and a long vanity dresser in his room as well. He had two nightstands along each side of his bed. I never understood why one man had a large room and an older couple had the tiny room.I felt the need to be quiet in father's room. This is not the same to say I felt peace, but quiet. The Purple Room-Ed's wife Natalie, has a family member with a purple room. Natalie and Ed moved back to Iowa for awhile for Natalie to finish her degree at Iowa State University. They lived upstairs of their grandparents house to save money while they both went to school. Ed finished his degree at DMACC and worked at Hach. When I would go see them most times I stayed on the couch upstairs with them. But for many reasons, mostly that I was a big brat at that time, after awhile I would end up in the Purple Room. To me it seemed like punishment. Perhaps mostly because the last time I stayed there my car broke down and the last thing I wanted was to be away from my best friend. Like I said, here I felt punishment. The Pink Room-J's family has a pink room. His mother has a farm house and if you wanted a bed to sleep on you ended up in the Pink Room. Now, I love pink, don't get me wrong. It is in fact, my most favorite color. But a whole room with pink on the walls and pretty pink things all around reminds me of a movie where they talk about the whole thing being pink and how it looked like Pepto Bismal threw up in the room. The bed was actually not one bed but TWO beds put together. Which then reminds me of an old 50's movie where they mushed tow beds together instead of sleeping apart. The room was along the kitchen wall and most of the time you could hear the conversation going on in the other room, which is quite irritating when trying to sleep. I felt such uneasiness when in this room. Feelings of not belonging or acceptance and though there was no where else to go, this ended up my place of retreat as well until we went home. Which now makes me ponder how a place I did not feel comfortable in, I became comfortable when need to escape. It makes me think how sometime people have bad things happen to them or uneasiness in their life and for the need to survive they learn to live with it and make it work for them. 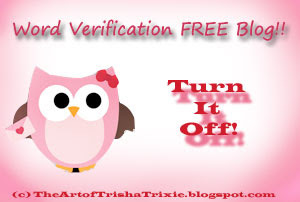 The Trisha Trixie's Sanctuary Room-This is my room now. I have had people tell me when they come into my room they feel fun and elation as well as a peacefulness they cannot explain. Whether I am in the room or not, they feel this. One person said they felt I left the feeling behind for others to feel it. If so it was unintentional. In this place my walls are white. The only color I have in the room are the color of my arts and crafts hanging all over, my Warriors for the Homeless Vision Chalkboard in front of my work desk, A bookshelf with all my art, fashion and work books and then my precious walls. My walls are my canvas perhaps. I was given two posters and hung them up with tacks like we used to when we were teenagers. Then I went to a concert and another poster went up. Then a musical. Then another musical. Then other pictures, posters and cards. Little by little this wall became my music wall and anime and manga wall as well. Then after I took Goddess Leonie's class I started putting things from her class on the side wall. With it were pictures and newspaper clipping of myself, my friends that had been in the paper and other business things. I named this place as Trisha Trixie's Sanctuary. After taking Jennifer Aritzen's class for the Right Brain Business Plan more affirmations and such went up and around. Then I was a great part of Summer of Color and my walls had color all a round. This was becoming my Sanctuary more and more. I felt safe here. I felt like my things were around me. Things that made me happy from pictures others had drawn for me like a huge Audrey Hepburn-Breakfast at Tiffany's framed, next to a printed Audrey canvas, or artwork and items I created down to simple cards and notes to help me remember my life goals. This place because my sanctuary so much so that when I received an offer on a job in Omaha I feared leaving it. There was another time that same thing happened. When I lived in Sherman Hill. It may have given me migraines. It may have been a tiny little studio apartment. But it was mine and it was my safe haven. It was my Sanctuary. I did not want to leave there either. Perhaps it was the peace and the happiness I felt in both of these places. These places were not making me pleased or happy because of any persons either, this was because of the changes I had made within myself. The accomplishments I felt being in these places. The freedom I felt here and the peace the knowledge of my accomplishments had given me. These places were my safe place like when children play tag and run around scurrying and going to and fro and when you make it to SAFE, you feel just that, SAFE. No one can harm you there. Nothing can get into your sanctuary. Others can't touch you, tag you or hurt you when you are on SAFE. The White Room-It is interesting tome how these other colors of rooms made me feel against my stark white room. It speaks to me that colors are powerful and can embody a certain feeling, true. My color of walls and the things within it have meaning and power as well. My walls may be stark white, but the love I have put in my Sanctuary Room brings me comfort and feels like a big hug when I am in it. I leave you with this thought...Looking back on your life, what rooms in your life either in your home or another perhaps or maybe someplace you visited made you feel like...well YOU? Is your current place like that now? Why not? Perhaps there is a color that speaks to you best. Perhaps your color is not one color it is many or two or three together (I like Pink and Green like in Wicked), or maybe it is the color of many colors like me in posters, cards, crafts, art and life. For me, my life is my color. What is your color? Find your color and find yourself. Thanks Elin! I love it when Artists are there for each other...even in our crazy whims! I am not sure where I found this artist on what blog or where. But I love seeing her work in my inbox regularly. I think I saw her work on CED or AEDM. I immediately fell in love and signed up to receive her post via email. I don't have a clue what her words are but that is the great thing about Art...you don't need words. When I see her work...I feel something. When I first saw her puppies I smiled. Some of her work makes melaugh. Some of her work makes me feel insightful. All of her work I love. Weather you understand the language of her words, please go find this artist and get to her the language of her work. You WON"T be dissapointed. In Brave Girls if you remember we made many Truth Cards. Brave Girls founders Kathy Wilkins and Melody Ross ask us to send in our Birdies if we make any. This is a Birdie Truth Card I made this weekend. I am moving "AGAIN" and I needed a reminder during this time that All the Best Moments happen Today. To me that means making them happen, they are happening and let them happen. 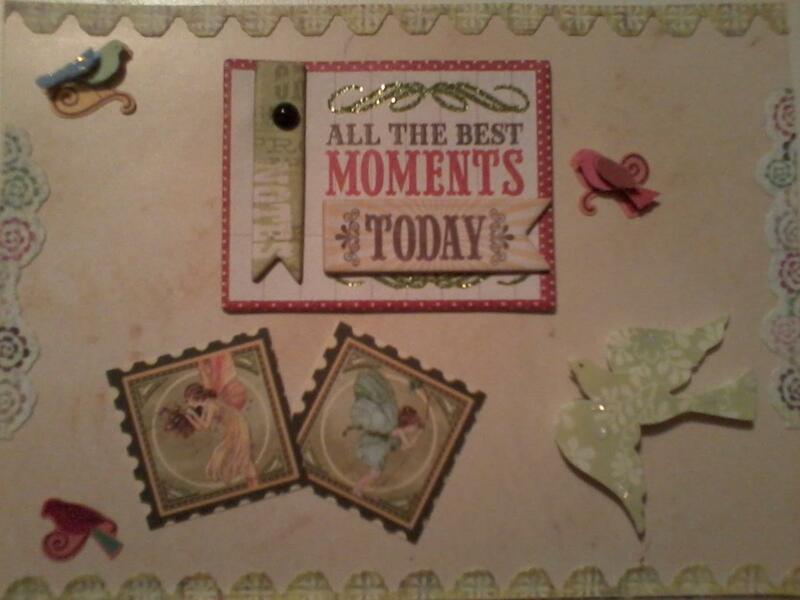 I took on of the KC and Company cards that comes behind the stickers and cut the top off and then added little birdie KC stickers for the birdies. 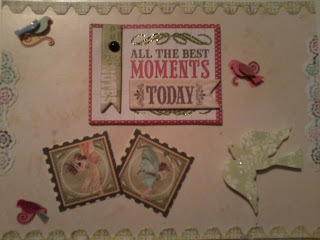 Then I had some Graphics 45 fairy stamps to add. The All the Best Moments sticker has an added sticker on top that says TODAY and I bought that at Mangelsen's Art Store here in Omaha. I don't remember who the designer is but it is a chipboard sticker on top of a chipboard sticker. I took some border stickers and cut them in half and added them to the bottom and sides. and was going to make a full one myself. But then I realized if I cut them in half I could get more out of them and it would make a cute 12 Days of Christmas Advent Calendar. I recently bought some Art of Paper Crafting from Mary Englebreit and scoured through those papers as well as other ME calendar moments I could cut out and stickers I could use. I found the quotes on another paper and put two quotes in each day. The candies were Sweet Tarts and Bottle Caps I had left over from Halloween.